Looking for a good holiday read? There was no shortage of excellent popular science books this year, from memoir, alternate science histories, and the poisons of Agatha Christie, to deep dives into string theory, quantum biology, and the mystery of life. 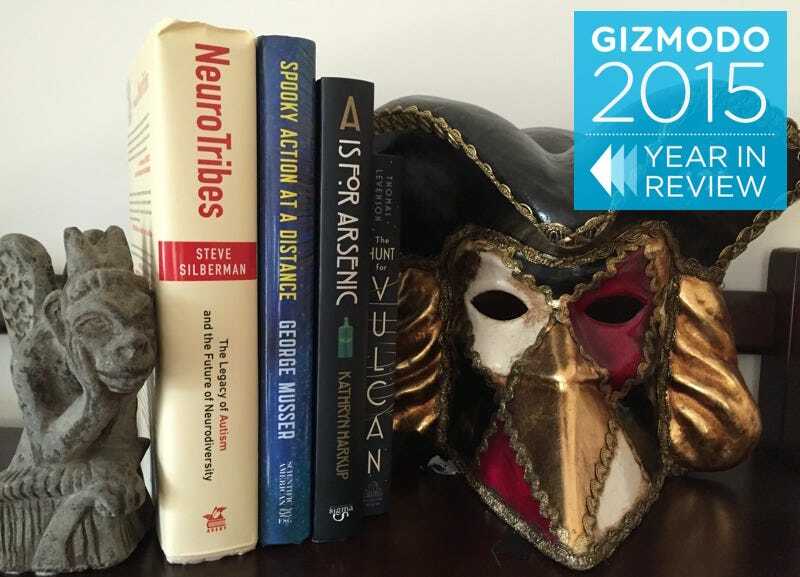 These are our most-loved popular science books from 2015. In 1951, British fantasy author T.H. White (The Once and Future King) wrote about his peculiar bond with a goshawk he trained, ruminating on how these loving connections to feral animal companions accustomed to the wild arise in the first place. Now White has a kindred spirit in Helen MacDonald, whose H Is for Hawk is part personal memoir, part classic nature writing, and part literary homage to White’s classic tale. MacDonald had always loved hawks as a child, perhaps because of, rather than in spite of, their fierce predatory natures. When her father died suddenly on a London street, she sought a means of dealing with her deep grief. So she adopted a goshawk named Mabel and set out to raise and train the bird herself. As White discovered decades before, it is no easy feat to train a bird of prey. And the challenge and resulting bond with Mabel proved to be just the thing MacDonald needed to transform her grief into something equally beautiful and wild. With its elegant, evocative prose and emotional depth, this book has topped a number of year-end list, for good reason. Even the most rabid Star Trek fan understands Spock’s home planet was fictional. But there was time when astronomers believed a planet called Vulcan might actually exist. In the 19th century, French astronomer Urbain-Jean-Joseph Verrier noticed something peculiar about the orbit of the planet Mercury: it didn’t seem in keeping with the laws of motion outlined by Isaac Newton two centuries before. He concluded there must be a hidden planet lurking nearby, launching a fruitless search that would span decades. There were perfectly good reasons to think so: a similar anomaly led to the prediction and ultimate discovery of Neptune in 1846. But as Tom Levenson relates, the hunt for Vulcan was based on a false assumption about how the universe works. It wasn’t until Albert Einstein invented his general theory of relativity that scientists realized Vulcan could not exist, and they had been chasing a phantom for the last 50 years. It makes for a helluva story, and Levenson has a particular gift for unearthing colorful details and arcane nuggets of history from the dusty archives to better illuminate his tale. But it’s also an intriguing glimpse into how science gets done, and how easy it is even for scientists to be blinded by their own pre-existing assumptions. Autism is one of those controversial topics bound to rouse passions on all sides, and Steve Silberman’s sprawling, impeccably researched tome has done its share of fanning the flames, even as it roared up the New York Times bestseller list and snagged the 2015 Samuel Johnson Prize for good measure. In particular, he argues persuasively for a recasting of autism not as a crippling lifelong disability, but as a different, equally valid way of thinking. Silberman traces the roots of our current polarized attitudes towards autism to the two men who pioneered the field: Leo Kanner and Hans Asperger. Asperger viewed his young subjects — with their “social awkwardness, precocious abilities, and fascination with rules, laws, and schedules” — as people with unique gifts who should be celebrated. Kanner had a much different take on such children, viewing them as psychologically damaged by cold and distant parents. Kanner thought the condition was rare; Asperger viewed it as fairly common. While he grapples with the inevitable hot-button topic of vaccinations, and offers an explanation for the perceived rise in diagnoses of autism since the late 1980s, Silberman also gives voice to the many people with autism who have learned to adapt and even flourish when they finally find their “neurotribes.” In the end, their experiences are what makes this book a must-read for anyone keen to understand the neurodiversity movement. Fans of Munroe’s brilliant xkcd webcomic and first book, What If?, will revel in his latest whimsical offering: a collection of simple explanations using just the thousand most common words in the English language, accompanied by the elaborate line drawings for which Munroe is justifiably famous. A microwave is a “food-heating radio box,” while the International Space Station is “the shared space house.” He calls cells “the bags of stuff inside you” and the periodic table “the pieces everything is made of.” I’ve long argued that 90% of not understanding even fairly advanced scientific concepts comes down to a lack of vocabulary: the jargon simply proves too impenetrable. Munroe’s masterpiece is the antidote to scientific jargon, ably demonstrating that not knowing the exact name for something doesn’t mean you can’t grasp how it works. The same holds for those doing the explaining: you don’t need to use big words to convey meaning. If anything, it just gets in the way. Ada Lovelace, a.k.a. Lord Byron’s daughter, has gained posthumous fame in the Internet age as a kind of proto-computer programmer, thanks to her work with Charles Babbage. Babbage tried to invent a steam-powered mechanical calculating machine he called the Difference Engine in the mid 19th century. Lovelace died young, and Babbage never built his engine, but their peculiar partnership has inspired more than one contemporary steampunk flight of fancy. And now we have Sidney Padua’s glorious re-imagining of this unlikely pair as scientifically minded crime fighters in an alternate reality Victorian England to add to the genre. (They also fight bad spelling for good measure.) It’s got whimsical illustrations, lots of fascinating footnotes, and even some rare historical diagrams of Babbage’s design for a steam-powered computer. That makes it hands-down a geeky delight. One of the weirdest aspects of quantum mechanics is entanglement. Two entangled particles affecting each other across vast distances seem to violate a fundamental principle of physics called locality: things that happen at a particular point in space can only influence the points closest to it. But what if locality — and space itself — is not so fundamental after all? That’s the deep cosmological question that George Musser explores in Spooky Action At a Distance, along with its mind-blowing implications. Naturally this takes Musser and the reader into some pretty knotty abstract concepts at the cutting edge of theoretical physics: string theory, the black hole information paradox, extra dimensions, tensor networks, and the disquieting suggestion that perhaps space-time isn’t the solid canvas of reality we’ve assumed it to be: it may be emergent, perhaps arising out of billions of entangled qubits. Musser grounds all this in the stories of the flesh-and-blood men and women who are chasing after the answers to these esoteric mysteries. Bonus: You can read an exclusive excerpt from the book at Gizmodo. Before Agatha Christie became the world’s most famous mystery writer, she worked in a pharmacy. That experience served her well on the subject of poisons, by the far the most common cause of death in her novels and short stories. Now Kathryn Harkup, a chemist by training, has written an engaging and endlessly fascinating account of the science of these poisons, set against the backdrop of Christie’s substantial oeuvre. Each chapter focuses on a particular poison, arranged alphabetically, from arsenic and belladonna to thallium and veronal. We learn about the particular novel or short story in which said poison was used, its history, whether it has an antidote (vital information for anyone hoping to survive such a murder attempt), and we even get a smattering of real-life poisoning cases for good measure. The reader emerges with a deeper appreciation for how well Christie knew her stuff — and perhaps just the slightest temptation to drop a bit of arsenic into the elderberry wine should unwanted guests come to call. For two-and-a-half billion years, life on Earth was limited to single-cell organisms (so-called prokaryotes)—and then suddenly, there was a jump to more complex life forms known as eukaryotes. How and why could this happen, and how did life originate in the first place? Biochemist Nick Lane proposes a possible explanation in The Vital Question: energy is critical to cell biology, specifically, the energy available in the extreme environment of alkaline hydrothermal vents. This puts him firmly in the “metabolism first” camp, as opposed to the more mainstream “replication first” camp, of life scientists. In the process, Lane seeks to redefine a fundamental question: just what does it mean to be “living,” anyway? It’s a deep read, so be prepared to get into the weeds of technical details, but it’s also a rewarding one. You’ll come away with a renewed appreciation for the wonders of life, and perhaps some interesting speculative ideas about the prospects for life forms on the millions of potential Earth-like worlds in other solar systems. Last year, noted physicist Lisa Randall co-authored an intriguing paper pondering the possibility that dark matter — the mysterious substance that makes up a good 21% of all the stuff in the universe — may have been at least partially to blame for the massive extinction event that wiped out the dinosaurs 66 million years ago. Now Randall has turned that speculative premise into a book, exploring our current understanding of dark matter and its role in the origin and evolution of our universe, spanning not just cosmology, but geology, paleontology, and particle astrophysics. The titular premise remains largely speculative: a comet passing through a disk of dark matter in the Milky Way was knocked out of its orbit just enough to redirect it on a collision course with Earth, and such events happen periodically. It requires a particular model for weakly interacting dark matter capable of forming such a thin disk in the first place. In theory, at least, there could be an entire “dark side” of the universe: a family of dark matter particles interacting via dark forces that mirror our existing Standard Model of particle physics. Randall builds a resonably convincing case for her central dino-argument, but the real joy of the book comes from everything learned about earth’s connection to the cosmos along the way. Even in the 21st century, the origin of life remains a conundrum, and while scientists have accomplished remarkable things in terms of cloning, synthetic biology, and similar areas, they have yet to infuse inert matter with that elusive spark of life. In Life on the Edge, Jim Al-Khalali and Johnjoe MacFadden argue that perhaps the missing ingredient might be found in quantum mechanics, drawing on cutting edge research into the emerging field of quantum biology to build their case. At first glance, this might seem absurd: we’re accustomed to hearing how quantum rules only govern the realm of the very small — far smaller than even cellular life. But quantum biology finds evidence of tiny quantum phenomena having cumulative effects on the behavior of much larger systems, such as bird navigation (how do migrating birds know where to go? ), photosynthesis, and our sensory perceptions (how do we really detect the scent of a rose?). Given these hints, it certainly seems possible that the quantum world could help unlock the answer to the ultimate question: what is life? Chances are, you’re not familiar with the 19th century German naturalist and polymath Alexander von Humboldt, largely recognized as the first to recognize the possibility of manmade climate change. And that’s a shame, because as Andrea Wulf’s biography makes clear, Humboldt was as much intrepid explorer and thrill-seeking adventurer as he was a sober-minded scientist. The dude climbed volcanoes, and traveled through Siberia, and won the admiration of luminaries like Goethe, Darwin, William Heschel, and Thoreau, among others. Humboldt proposed the concept of climate zones, and cautioned that increasing industrialization could adversely affect the planet — although few contemporaries believed him at the time. But Wulf contends that his most enduring contribution was to view nature as a “complex and interconnected global force that does not exist for the use of mankind alone.” This is another book that’s topping a lot of year-end lists, as it should, since it’s a gripping read. Humboldt’s influence can still be spotted in much of nature writing of today. Economics is often called the dismal science, but Richard Thaler’s riveting, often hilarious account of the rise of the radical notion of incorporating human frailty into economic theory is anything but dismal. Most such theories assume people will act rationally when it comes to making financial decisions; Thaler argues that the reality is quite different. Humans are prone to any number of cognitive biases that cause them to behave irrationally — and those poor decisions can adversely affect financial markets. 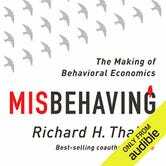 This could have been a dry treatise outlining the history and main principles of behavioral economics, but Thaler is a born raconteur, wrapping his points in amusing anecdotes and real-world examples, like how Costco’s business model explains transaction utility, and why the principle of sunk costs explains why you’ll stubbornly keep wearing a pair of ill-fitting $300 shoes. Reading about economic theory has never been so much fun. Now it’s your turn: What were the best science books you read this year?